HARTFORD, Conn. (WTNH)– The Speaker of the Connecticut House says he is increasing the odds that an expansion of casino gambling will pass this year. The prediction comes in the aftermath of greater red ink, and as a third Native American Tribe says they can increase the stakes for the state. 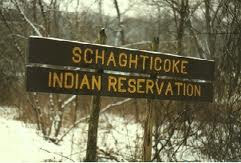 The third tribe is the state recognized Schaghticokes. You will recall they got federal recognition 13 years ago, only to have the U.S. Bureau of Indian Affairs reverse their ruling in the aftermath of massive public and political pressure here in Connecticut. But the Schaghticokes say they still have friends in the gambling industry that will bankroll them. Lead by tribal chairman Richard Velky, members of the Kent based Scahghticoke Tribe invaded the Capitol complex today, urging that they be allowed to compete for a third gambling casino that they would like to establish southwest of New Haven to take advantage of what all parties agree is the potentially lucrative metropolitan New York City area. “Anywhere in Fairfield County, preferably for me, probably be Bridgeport. We have always show an interest in Bridgeport. Bridgeport has always shown an interest in the Schaghticoke,” said Velky.